Heads up guys the offroad track is open to Electric vehicles only tomorrow due to the botw oval race. Please no nitro. Also I expect every pit table to be full so you should bring a table and extension cord. Thanks! Here they are the Nitro Winter Series Champions. Again thanks to everyone who came out to support the series both the Elec and Nitro series were great successes. No doubt! Super excited to run with you guys! Time to step up Brent and run with the Big Boys! Summer series sweet!!!!! Is there any difference between the scte now and the new 2.0 scte out other than chassis? Thx for the pics Craig. Great winter series this year. Count me n Lou in for the outdoor series. Congrats to all the winners of the 2012-13 Electric Winter Series. Thanks to everyone one who came out and supported the series. Be on the look out for a new 1/10 electric series starting on the outdoor offroad track. 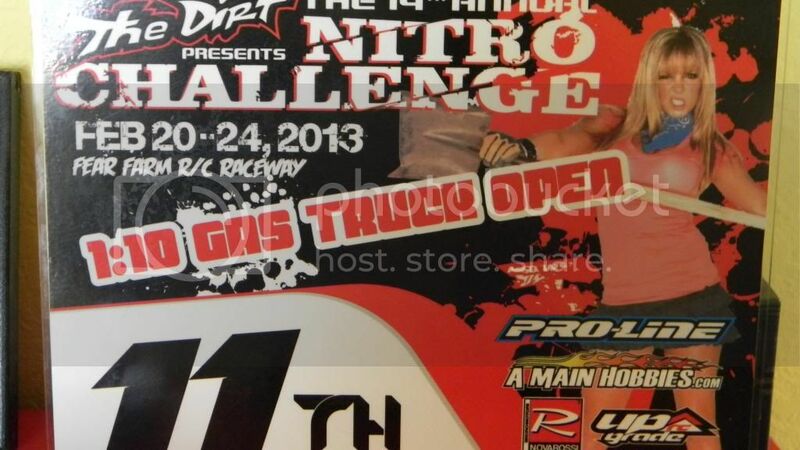 "NITRO NITRO ALL DAY SATURDAY SATURDAY"
Hay we going to run the gas trucks this saturday?? I Just coming off my 11th place A main finish at the DNC. you gonna do VTA or world GT? Big J I believe Kraigs does the offroad point and he has a day job.. quit your whining..hot dog.